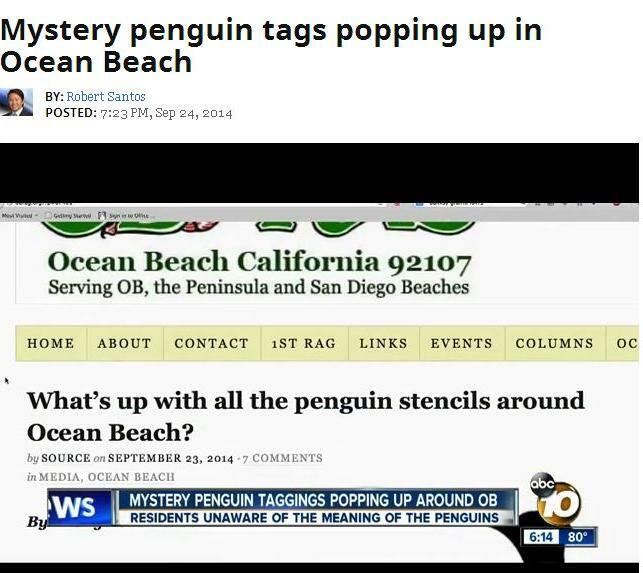 As the controversy surrounding the anonymous stenciling of penguins around Ocean Beach continues, local TV station Channel 10 was one of the only stations to send out a camera to cover it. And in the process, they gave a nod to the OB Rag. Residents in Ocean Beach want to know who is behind mysterious penguins that have been popping up around town. Whoever is responsible uses a stencil to paint the penguins as fast as they can in public places. 10News reporter Robert Santos found out that as harmless as the tags look, not everyone is happy with them. In Ocean Beach, it is clear people love art. It is everywhere: on utility boxes, on the sides of buildings and even on trash cans. But those are legal. There is one painting – or technically graffiti – that has been popping up around Ocean Beach unauthorized. It shows a stenciled penguin with a heart. “We had this brand new paint job so it stuck out pretty quickly,” said Drapeau. Jeff Rathause, the owner of the Second Chance Sport shop, says his store was tagged with the penguin as well. “When I pulled up to work, I said, ‘There’s another thing there,'” said Rathause. The penguin was painted next to a peace sign that another vandal tagged years ago on the roof of his shop. “Nobody knows what it (the penguin) means. Didn’t seem too mean or anything, so I left it up,” added Rathause. 10News found another penguin stenciled near the skate park on the sidewalk and on the freeway ramp off Interstate 8. The penguin graffiti is not as destructive as the damage caused by two vandals who etched more than 90 windows in Ocean Beach, causing tens of thousands of dollars in damages. Still, when 10News showed the penguins to the Ocean Beach Main Street Association, they had one message to this latest mystery vandal. “We don’t appreciate tagging. Period,” said Denny Knox. If caught, graffiti vandals in San Diego can be fined and send to jail or juvenile hall. If they are minors, parents can be held responsible for up to $25,000 worth of damage. I guess the people behind this story don’t have a good understanding of tagging/stenciling/streetart. The main motivation is to have their tag seen by as many people as possible. The more its seen, the more notariety they get, the more dedicated they are. Putting the tags on display on television and the news does nothing but encourage this person and others like him. This press has given him much more than he had accomplished with some acts of vandalism around town. The best way to deal with this is to record it, photograph it, and report it. But putting the tag on tv and the web just encourages more vandalism. Not very repsonsible reporting on this one. Maybe it is SeaWorld trying to drum up business for their penguin exhibit. We did hear that attendance has been down….. Hmmmm.